When customers board the METRO Blue Line, Northstar Commuter Rail or use the rear entrance of buses on the new METRO Red Line, no one is at the door collecting fares. But that doesn’t mean customers are getting a free ride. This common transit industry practice is called Proof of Payment. 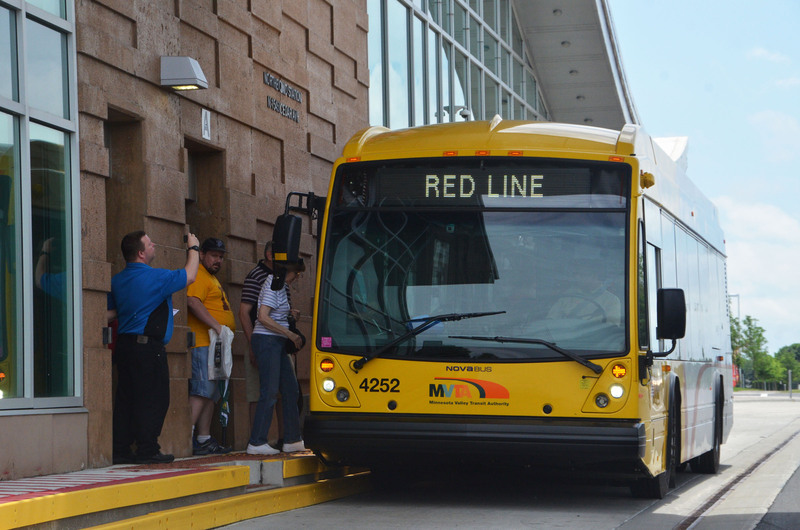 In the Twin Cities, fares are checked by Metro Transit Police officers while customers are riding a bus or train or in paid-fare zones like rail platforms. Go-To Cards with stored fares or transfers can be checked with digital handheld devices while paper receipts provide proof of single payment for individually-purchased rides. By eliminating individual fare checks during boarding, trains and buses spend half as much time "dwelling" at stations and more time moving. The same theory is at work behind Pay Exit service, in which customers pay fares at the end of their trip. The Proof of Payment model is also significantly less expensive and intensive than installing and maintaining gate technology used in older (typically subway or elevated) transit systems. In addition, the presence of licensed, uniformed police officers onboard vehicles and patrolling stations increases safety and security in the transit system. This approach is sometimes misunderstood as an "honor system" in which customers are easily able to board without paying and there no penalty (except perhaps a moral one). Like some drivers who take a chance by using a parking meter without paying, there are some transit customers who "play the odds." This gamble has a very poor average payoff in a Proof of Payment system because those who have not paid for their trip not only face removal from the vehicle, but a $180 fine, a misdemeanor citation and the possibility of being excluded from the transit system for a month or longer. Metro Transit’s fare policy provides for inspection that is “high-visibility, with pleasant, yet firm enforcement.” Officers may cite any individual they believe is purposely evading fare payment. Citations are rare, however, because the overwhelming majority of those using the Twin Cities transit system pay fares. Based on data collected from tens of thousands of weekly police engagements, fare compliance rates are well above 99 percent. In addition, Metro Transit is continually top-of-class among similar transit systems throughout the country in terms of "farebox recovery" — the share of operating costs covered by customer fares. In other words, in the Twin Cities, customers fund a higher proportion of the transit system's operating costs directly through fares than in similar regions throughout the U.S.
Outside observers of the transit system who expect to see train customers buying a ticket from a machine on a rail platform should realize not every fare payment is easily visible. 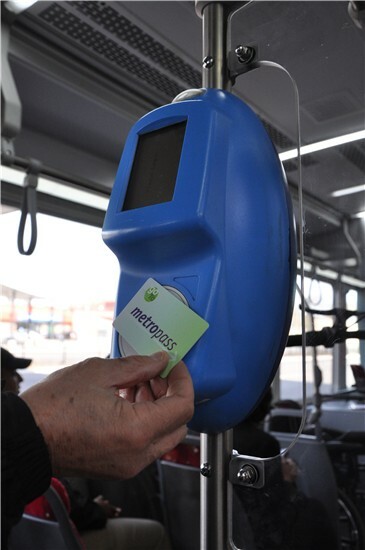 A growing majority of customers use Go-To Cards to pay their fare in a split second by simply tapping their card to a reader as they pass by (many customers do this with the card still in their purse or wallet). Other customers use a paper transfer from a bus which they retain and show to officers as proof of payment. Customers can ride on a single fare for 2 1/2 hours at the same fare level. As with Northstar Commuter Rail and the Blue Line, officers are patrolling buses on the new METRO Red Line at random periods each day. Proof of Payment will also be integral for Arterial Bus Rapid Transit corridors such as Snelling Avenue, where fares will be prepaid at station areas to help speed service.